Well, this is a winner…I don’t know what else to say. Everyone in my family loved it and even though I was full, I wanted to eat more. Good thing they were already gone. I somehow managed to get delicious, fall off the bone, melt in your mouth ribs from my very own kitchen. I’m so excited to share this with you! I was surprised at how easy these ribs were to make. I couldn’t believe it turned out the way it did (aka amazing). I’ve done these a couple of times now and I really don’t see how you can go wrong. You do have to plan ahead a bit, since these take a good 2 1/2 hours to make. 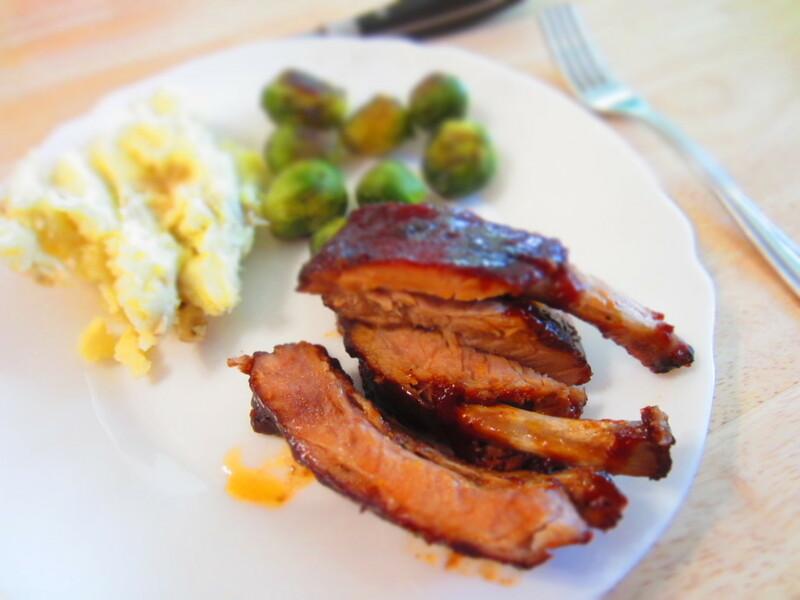 Usually, in my experience anyway, people don’t just buy ribs to throw in the oven on a night they need a quick meal anyway, so I think most people will be on the same page when they dive into this recipe. The rub on these ribs is full of flavor, my husband actually requested it without BBQ sauce on it. He likes all the flavors from the rub and doesn’t need anything to counter it. I really love BBQ sauce so for me the flavors balance out nicely. I put this under the “I’m feeling ambitious” category, along with a few others…not really because it’s hard and takes a lot of hands on time, but because I have found that many people steer clear of making ribs because it intimidates them. So…buck up and try it!! For goodness sake you are missing out on ridiculously good flavor (for half the price if you went and bought them from a restaurant I might add). So just do it, just try it, just once! Combine chili powder, paprika, garlic powder, and onion powder. 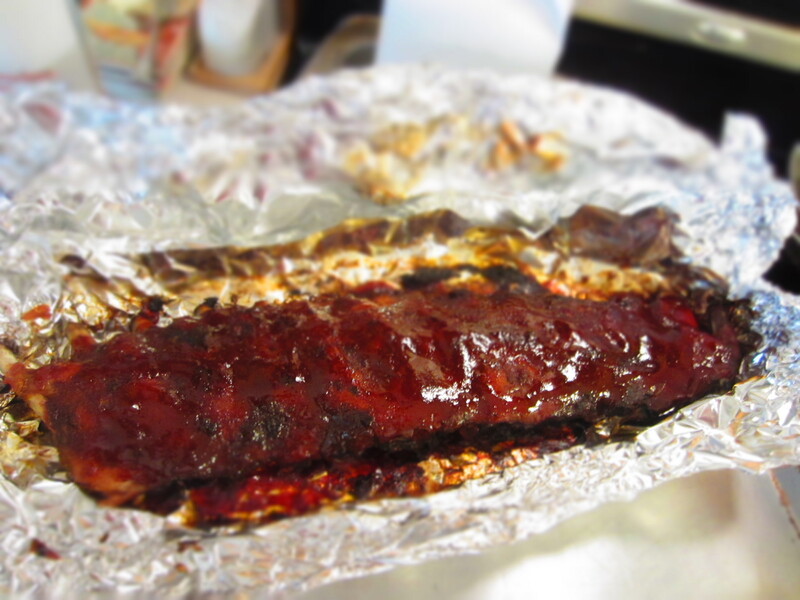 Place two large pieces of tin foil (enough to wrap the ribs in) on a large baking sheet. Place ribs on the tin foil and rub the chili powder combination on both sides of the ribs, using 2/3rds of the mixture on the meaty side and the remaining amount on the bone side. Place the ribs meat side down in the tin foil and wrap it by pulling the tin foil from each side up, and then bringing the long sides together, rolling it down, making sure that it is completely sealed. It does not have to be tight up against the meat, just make sure it’s sealed. Bake at 275 degrees for two hours, remove from the oven, open up the tin foil (watch out, it’s hot!). Flip the ribs over so the meat side is up and brush on the steak sauce, then layer on the BBQ sauce (feel free to add more or less according to tastes). Bake, uncovered for another 30 minutes. Tastes great with dark green vegetables!